What’s a film festival without a bit of sightseeing? 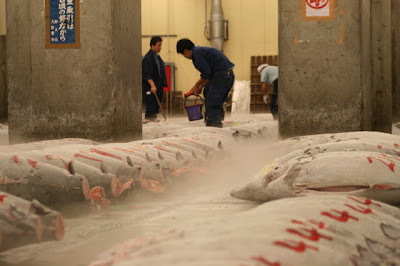 Visited the Tsukiji Fish Market during our recent trip to Japan. We’d heard so much about it and were determined to go, even if it meant staying up all night. The idea was to arrive before dawn, catch the tuna auction, and have a whole load of sashimi for breakfast. But it is one thing to eat pre-cut fish slices. Another, to well, meet your food before the meal. Must have been the sleep deprivation, because we did not expect to be so overwhelmed by seafood at Tsukiji. Where did all the tuna come from? 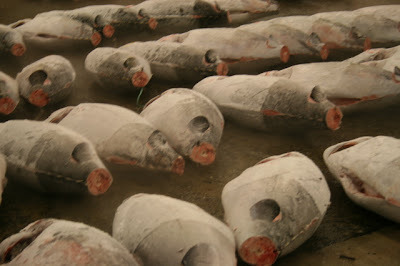 How many are left in the sea? What happened to their heads and tails? We should have had breakfast, really. Quit being so bloody squeamish and stupid. After all, we’d had plenty of training downing sacrificial cows, goats, pigs, chickens. Why then did our stomachs churn so at Tsukiji? Must have been the sleep deprivation – we left without eating anything.